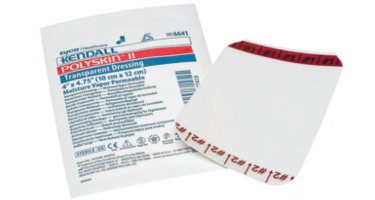 Navigate: Store / Dressing/Tape/Prep / Kendall Polyskin Transparent Dressing 4"x 4-3/4"
Kendall Polyskin Transparent Dressing 4"x 4-3/4"
Kendall Polyskin 4" x 4-3/4" transparent film dressing consist of a thin, polymer film coated with a hypoallergenic adhesive. Designed for protecting skin and wound sites. A simple, effective delivery system allows for one-handed application. It is impermeable to external liquid and microoraganisms, and provides better adhesion in moist environments.